A limited selection of aggressively priced Greenstone slate packages that might be the solution for your slate project. To discuss any of the listed slate specials, please contact us toll free at 800.619.4333. Introductory Offer: 50% off ! Nothing can compare to the beauty and durability of a HailFire™ slate roof consisting of genuine Vermont Estate Grade slate, installed using the SlateTec™ installation system. 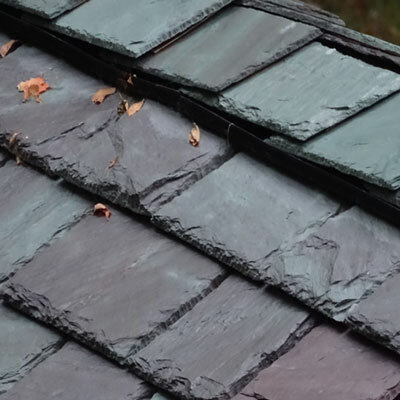 Greenstone Estate Grade slate with its distinctive grain is an unmistakable slate roof with an expected usage of over 150 years. At a thickness of at least ¾″ it is practically impervious to hail. FM 4473 Class 4 – the highest class rating for impact resistance. 40% less weight compared to traditional slate roof installations. The Vermont Autumn Blend slate colors consist of grays, greens, buffs, tans and charcoals. Class 4, FM 4473 impact tolerance rating – the highest there is. Sale price: $350 per square. Available while it lasts.